The exterior may be very private and have few windows, but the interior is bright and open. The architects have created this effect by designing an L-shaped volume around a small outdoor courtyard. This created the opportunity to install windows with a more private outlook. The natural light has been harnessed even further by adding very large windows well above ground level. 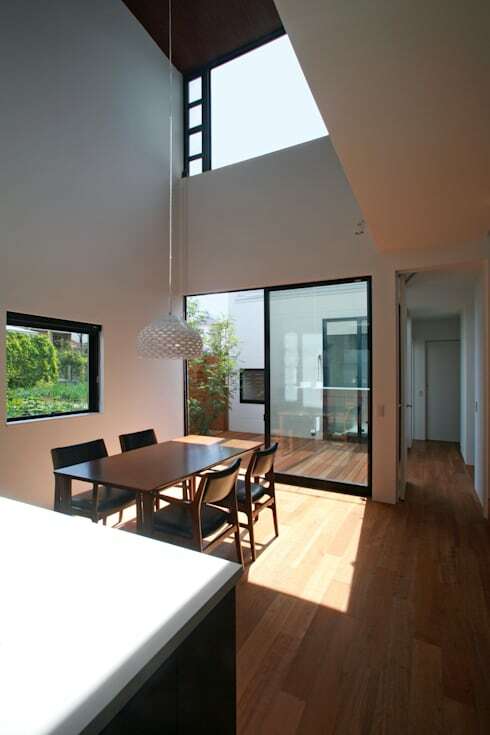 See how the lack of barriers allows the natural light to flow freely between the two levels of the home. The home has an open-plan layout with a good separation of the living zones. 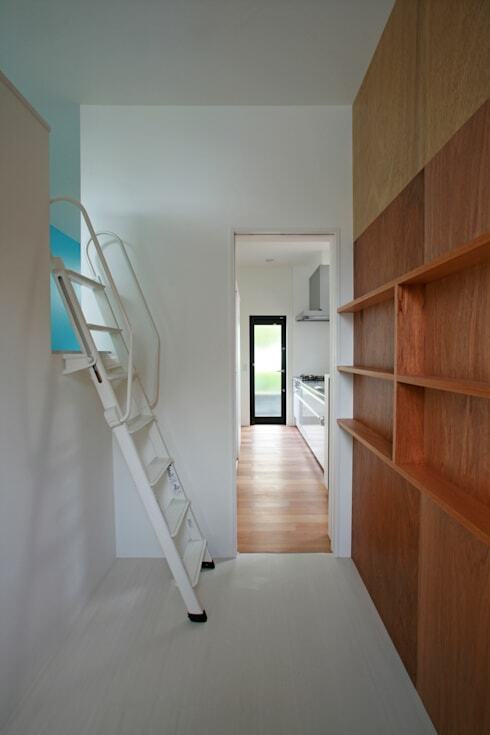 From this angle, we also get a sense of the careful balance of spaciousness and cosiness in the home. This is largely due to the combination of modestly-sized living areas and the double-volume height of the main room. The wooden flooring and furnishings are another important element in the warm family-style ambience of the home. Also note the blue wall behind the kitchen. We'll explore this area a little later. 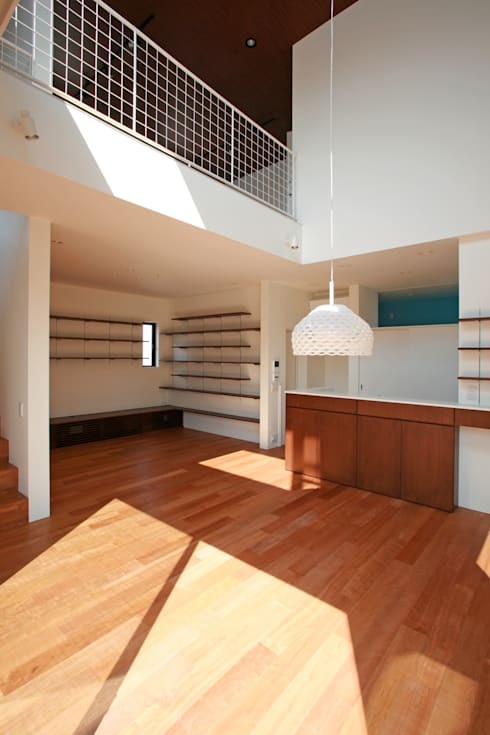 As with many Japanese homes, this one has built-in wooden furniture. It has been custom made to fit neatly into the edges and crevices of the home. This helps create the streamlined, elegant look of the living room. 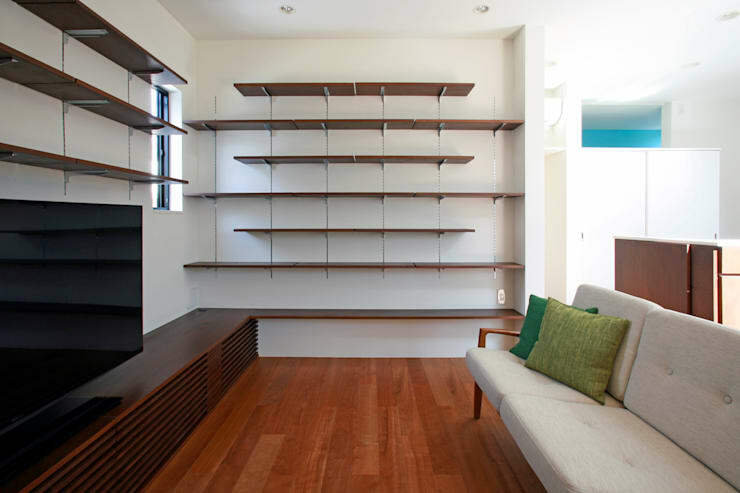 See how the wooden bookshelves and simple wooden bench are made from a darker timber. This combination of wooden materials is commonly seen in Japanese-style homes. The modern kitchen is replete with steel materials and has a modern, industrial-style look. There are no extraneous details and the single kitchen bench is simple, straightforward and fits beautifully into the interior scheme of the home. 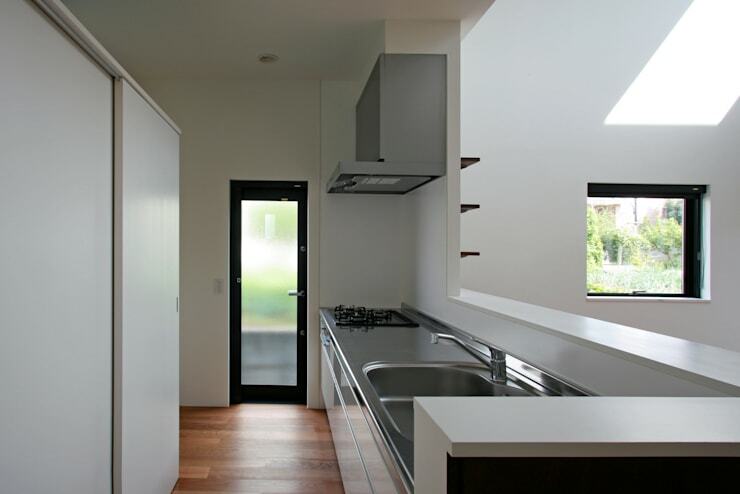 We love how simply the kitchen storage area or pantry has been designed. From the outside, it appears as just a simple, sliding white cabinet door. Finally, see how the kitchen has been set up to face the living area. This helps the occupants enjoy an easy communication between the two living areas. 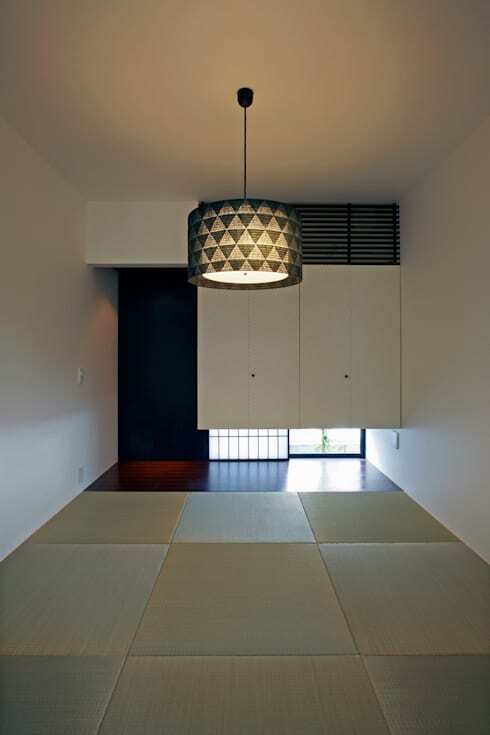 No modern Japanese home is complete without a tatami room! This one has a wonderful window feature that allows ambient light to enter the room and gives the occupants lots of privacy. The suspended cabinet also provides extra storage space. Finally, for those who are relatively new to Japanese design, a tatami room like this is normally used for socialising and occupants will never wear shoes inside such a room. Leading off from the kitchen is this unusual little transitional space. It has a wooden wall and a ladder that are surely popular with the family cat! The unique narrow doorway gives this area a playful quality. Check out the little ladder too. It leads to an unusual playroom or narrow sleeping loft. This little room definitely adds a unique quality to the home. 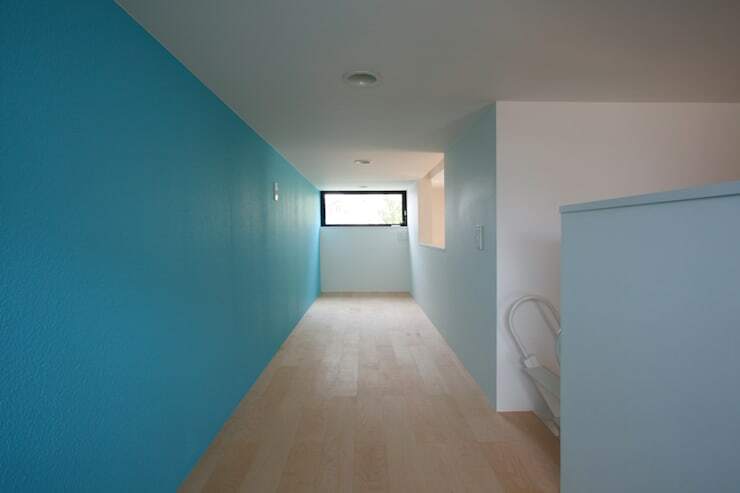 This narrow room has a lovely blue feature wall. This little narrow room could be used as a play area for children, animals or even a little sleeping loft. Note the internal opening that connects this area to the kitchen. This may be a sophisticated modern home in some ways. But it's also a playful home designed for enjoying a private family life. For more architectural inspiration, check out A small apartment bursting with life. 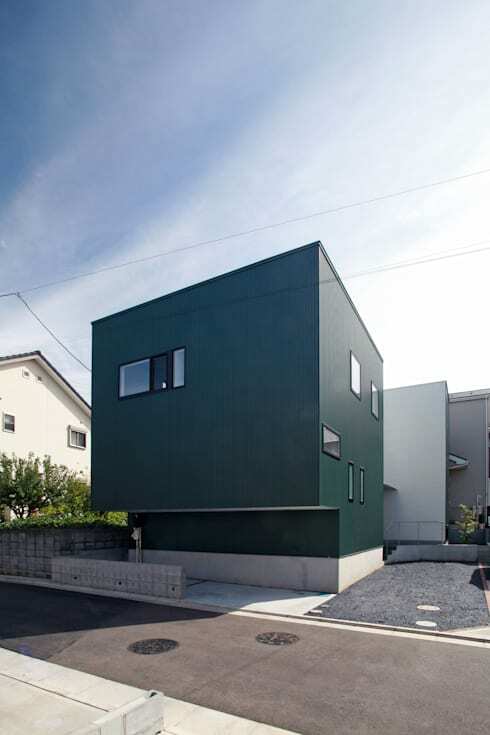 What do you think of the private feel of this Japanese home?